Scientists develop artificial skin made of transparent nanotubes | UNBELIEVABLE! 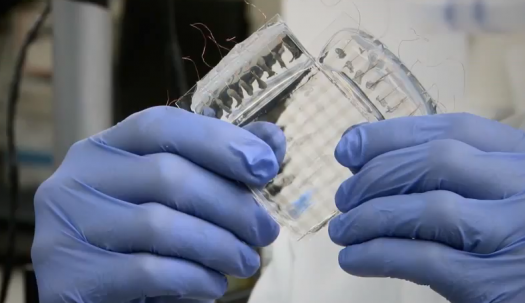 Scientists at Stanford Universityhave developed the prototype of synthetic skin that is stretchy, transparent, and highly sensitive. It is made from spray-on carbon nanotubes, suspended in liquid, applied to a layer of silicon. The nanotubes act as springs and are able to measure the force being applied to them. The “skin” could be fitted to robots to mimic the sensation of feeling and sensitivity. However, its inventors have broader, more human ambitions for its application. “The ultimate dream of this type of research is to restore functionality to lost skin, or amputees, or injured soldiers or burn victims,” said Stanford’s Darren Lipomi, author of the paper describing the new sensor. Posted on October 27, 2011, in Biology and tagged nanotubes, Robots, skin, Stanford. Bookmark the permalink. Leave a comment.